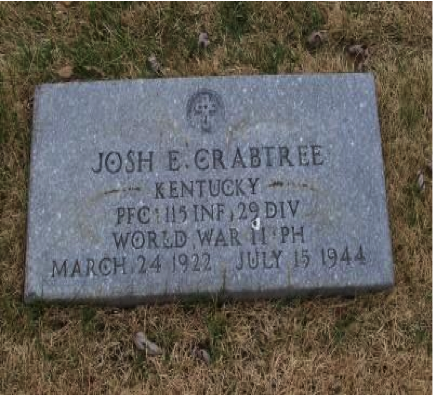 Josh Edward Crabtree was born on March 24, 1922 in Harlan, Ky. His father’s name was Taylor Crabtree and mother’s name was Lotus Wyoma Oliver. He went 3 years of high school, at Corbin High School. Josh was a Private First Class with the 115th Infantry, 29th Division. He was killed in France on December 14, 1942. He received the Purple Heart.